Why not try a different take on guacamole? 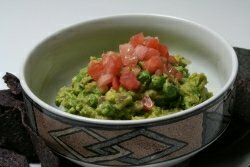 Dana Jacobi wrote this Green Pea Guacamole recipe. Dana is the author of 12 Best Foods Cookbook and contributor to the AICR’s New American Plate Cookbook: Recipes for a Healthy Weight and a Healthy Life. We love Dana's recipes here at All-Veg.com. We have quite a few of them that have been submitted by the AICR. Dana always uses the best ingredients, rich in flavor and nutrition. Healthy recipes. And if you are going to snack on tortilla chips and guacamole, why not try this one? This recipe gives a different spin to the guac make-up by adding green peas. Yep, green pea guacamole is very tasty. It has all the "normal" guac ingredients like onion and tomatoes and something to give it a little heat. And it certainly includes the requisite avocado! Wouldn't be guac without it, right? But we think Dana may be on to something here with the addition of the green peas! The peas really add a different flavor essence to the dish. So try it - you'll like it. I know we do! peas on a double layer of paper towels and blot dry. Place peas in mixing bowl and mash with fork while still warm until peas are mushy. like. Mix in onion, cilantro, lime juice and cayenne. Season guacamole with salt and pepper to taste. Just before serving, sprinkle tomatoes over guacamole.